In the processing of powders and granules, milling and sieving is most often required in different production stages. Together with Frewitt, PPS offers a wide range of high quality milling and sieving equipment, delivering high output and a minimum of waste. Particle sizes range from 5 cm down to 250 µm in production equipment and down to 50 nanometres for lab mills. We deliver standalone units as well as complete production lines, including isolators for containment. 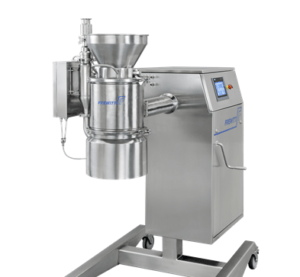 For the milling and sieving equipment WIP (Washing-In-Place), CIP (Cleaning-In-Place) and SIP (Sterilization-In-Place) are available as options. 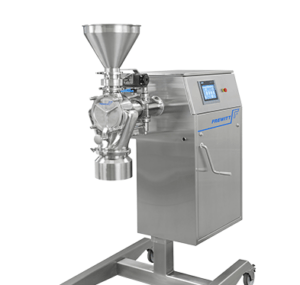 Frewitt develops and manufactures milling and sizing equipment for the pharmaceutical, food and fine chemical industries. 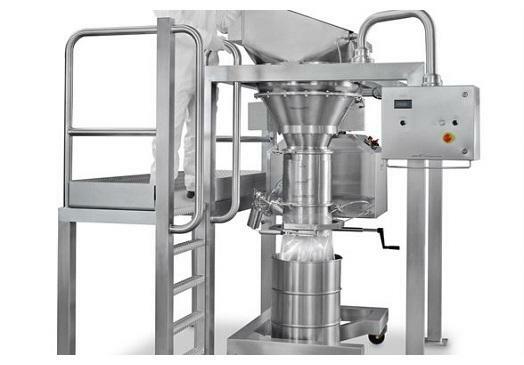 Frewitt is also an expert partner for high-tech sieving, homogenization, de-agglomeration, conveying, dosing and filling solutions for powders and granulates of every type. Crushers – or de-lumpers – pre-crunch hard products and lumps into fine-flowing powder. It can be used for continuous operation or serve as a standalone unit. The crusher can handle a wide range of applications, from all types of wet products to dry or sensitive products. Particle size range down to 250 µm. Throughput up to 11,000 kg/h depending on product and particle size. High production flexibility due to the large selection of tooling. Conical mills are ideally used for de-agglomerating and sizing granules. It can be used in any type of milling process, including milling of temperature-sensitive products or potentially explosive substances. Large selection of milling elements is available for flexible application. Particle size range from 5 cm to 150 µm (lab scale 10 mm-150 µm). Production volume from 500 to 5,000 kg/h. Standalone unit or part of a complete production plant. Hammer mills are used for milling and pulverization of hard, crystalline, and fibre-rich products. 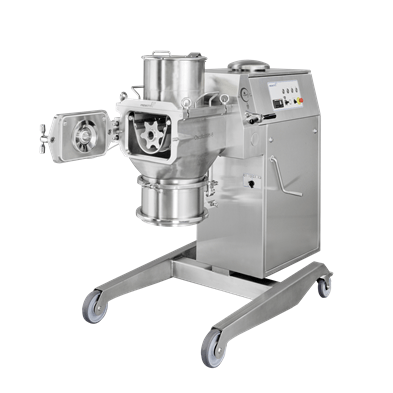 The hammer mill is suitable for laboratory applications, small batch production as well as large capacity production. It is designed to ensure optimum production in high-containment environments. Particle size range 2 cm to 30 µm (lab scale 10 mm-30 µm). Processing throughput up to 5,000 kg/h. Broad range of applications, from all types of wet to dry powders. The rotating sieve drum gently and efficiently processes the product owing to the centrifugal forces and the two changeable stator arms. It is ideal for homogenizing and control-sieving granules. It comes as standalone unit, inline, or as integration in complete plants. Particle size range up to 150 µm (lab scale 10 mm-150 µm). Throughput from 1,000 to 25,000 kg/h. The modular design offers high production flexibility. The oscillating sieve mill is used for milling and de-agglomeration of products that are heat sensitive or difficult to process. Highly flexible production offered through the selection of oscillatory or rotary modes as well as the broad range of supplementary equipment. Particle size range 5 cm to 250 µm (lab scale 20 mm-250 µm). Production volume up to 1,000 kg/h. Handles most applications including sensitive powders. 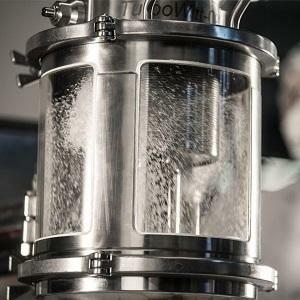 NanoWitt lab mill is designed specifically for wet nano milling of pharmaceutical products down to 50 nanometres. 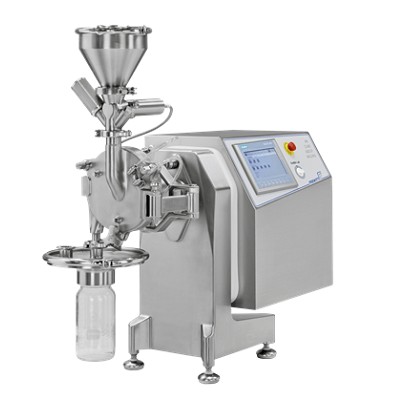 It operates with high efficiency and offers multiple operation modes (batch, semi-batch for filling and emptying, external recirculation). The milling head can be easily integrated into a rigid or flexible isolator. Particle size range down to 50 nanometer. 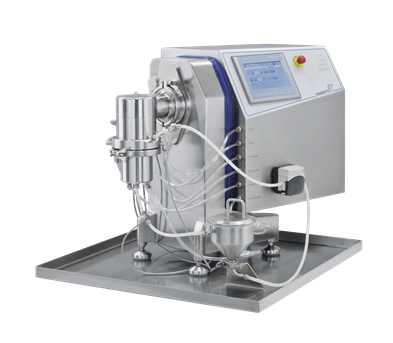 Processing volume from few milligrams up to 1.5 kg of solids. Easy integration and quick setup in any lab. 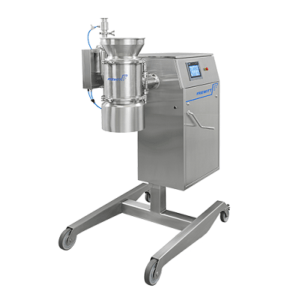 The pin mill is specially designed for pulverizing hard or crystalline products to particles down to sizes of 10 µm. It is ideal for small-scale lab quantities of 50 g to 1 kg, but also allows for pilot-scale batch sizes of 50 g to 30 kg. Milling heads are easily interchanged and can be integrated into a rigid or flexible isolator. Particle size range down to 10 µm. Production volume from 50 g to 30 kg/h. Scale-up guarantee to Frewitt FreDrive production equipment.